In Quanzhou, one of China’s most cosmopolitan cities, wealthy Muslim traders once built spectacular mosques. 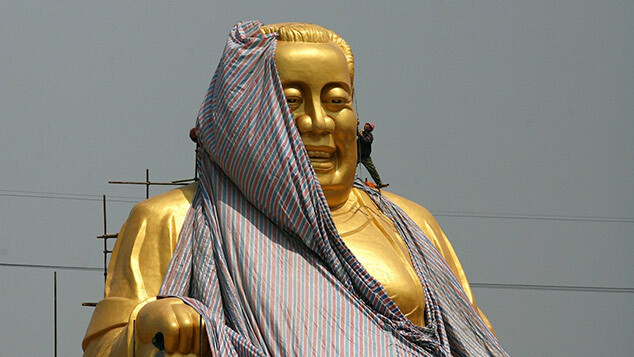 Ma Te is a freelance writer focusing on cultural relics and ethnic history. This is the second part in a series on the history of Islam in Fujian province, eastern China. The first article can be found here. 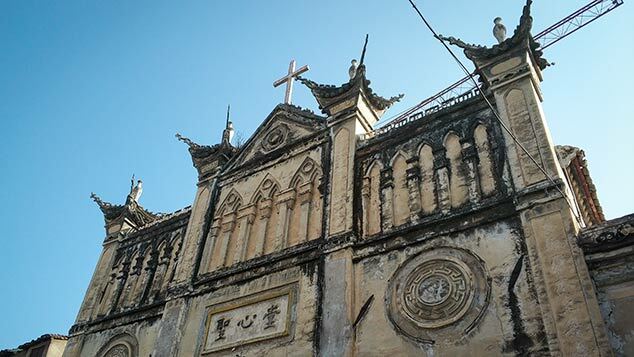 Even more so than Fuzhou, the capital of eastern China’s Fujian province, the nearby city of Quanzhou is renowned for its religious diversity. The city was China’s major port for foreign traders from the 11th to the 14th century, and was visited by the inimitable explorers Marco Polo and Ibn Battuta. For instance, Qingjing Mosque in Quanzhou was once one of China’s most ancient Islamic holy sites. Along with Hangzhou’s Phoenix Mosque, Guangzhou’s Huaisheng Mosque, and Yangzhou’s Xianhe Mosque, it was also one of the so-called Four Great Mosques that dotted China’s southern coast. First built in the Southern Song Dynasty in the 12th and 13th centuries, Qingjing Mosque was tragically destroyed by the flames of war at the end of the Yuan Dynasty nearly 200 years later. Locals have preserved a historical site called the “Remains of Qingjing Mosque,” but this is in fact a different site built during the Northern Song Dynasty (960-1126) and known in Arabic as the “Masjid Al-Ashab.” The confusion between the two mosques results from the latter’s reconstruction during the Ming Dynasty (1368-1644), when stone tablets and inscriptions on wooden boards belonging to the former Qingjing Mosque were used during the construction of the new mosque. In the courtyard of the Masjid Al-Ashab’s ruins are a few crumbling tablets and stone pillars, as well as an incense burner, a stone board with Arabic passages from the Quran engraved into it, a transcription of the Yongle Emperor’s 15th-century edict to protect Islam, and a newly built but rather humble house of worship where the local Muslim community prays. A middle-aged mosque employee surnamed Huang — a Quanzhou native who belongs to the Hui ethnic group — told me that he is one of only a handful of local Muslims left. By the time the People’s Republic of China was established in 1949, there were just a few hundred Muslims left in Quanzhou. Later, urban redevelopment displaced that small community from its traditional boroughs. Now, the vast majority of Muslims in the city are migrant workers. Most of them come from the northwestern province of Gansu and the Xinjiang Uyghur Autonomous Region. At the end of the Muslim holy month of Ramadan each year, the town’s celebrations are nonetheless able to attract up to 500 people. Historical records indicate that during the Tang Dynasty, the Muslim Prophet Muhammad sent four wise men to China, two of whom came to Quanzhou. “In the past, at Eid al-Fitr, we would just read from the Quran. We didn’t have any special events, and very few people came to the town,” Huang says. “Later on, we began to cook food for everyone to eat. 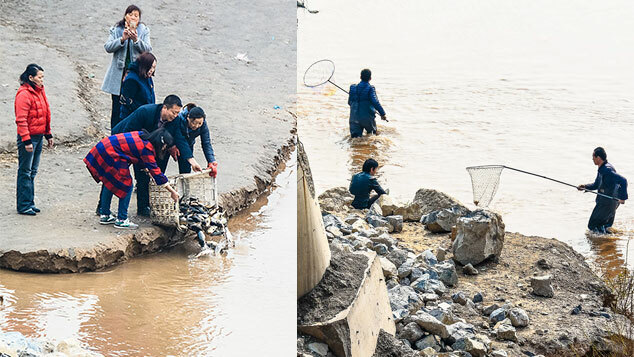 Now, our events bustle with activity.” People in Quanzhou have observed folk events for hundreds of years, and communities of different faiths have taken inspiration from one another when planning traditional celebrations. Quanzhou has another famous Islamic heritage site: the Holy Tombs of Lingshan, famous for being one of the oldest and best-preserved sacred Islamic sites in the country. Historical records indicate that during the Tang Dynasty, the Muslim Prophet Muhammad sent four wise men to China, two of whom came to Quanzhou. When they died, both men were buried at Lingshan. 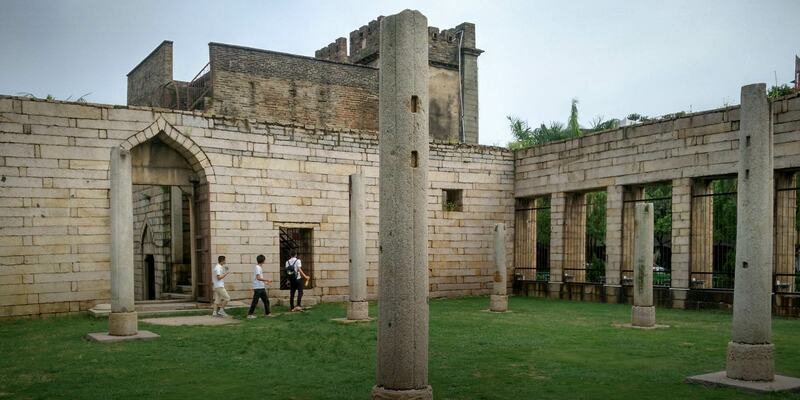 In addition to the stone pavilion on the mountain’s peak, where the two holy tombs are located, Lingshan is also an ancient burial ground for local Hui Muslim descendants of the Ding clan — wealthy merchants who used to trade along the old Silk Road. One of the many tombs scattered across the mountaintops bears the Arabic inscription “Ding Clan Hui Tomb.” Underneath this inscription is a crucifix, which in turn contrasts sharply with the two Chinese-style eternal flames in front. The overall design of the tomb is somewhat reminiscent of a Buddhist temple. In this burial ground, this mixture of influences is not uncommon, reflecting the local people’s openness to a range of different faiths and beliefs. Such designs exist partly due to the highly secular nature of traditional Chinese beliefs. Historically, the people of Quanzhou first tolerated a panoply of different religions, then acculturated their devotees and explored various forms of spirituality. 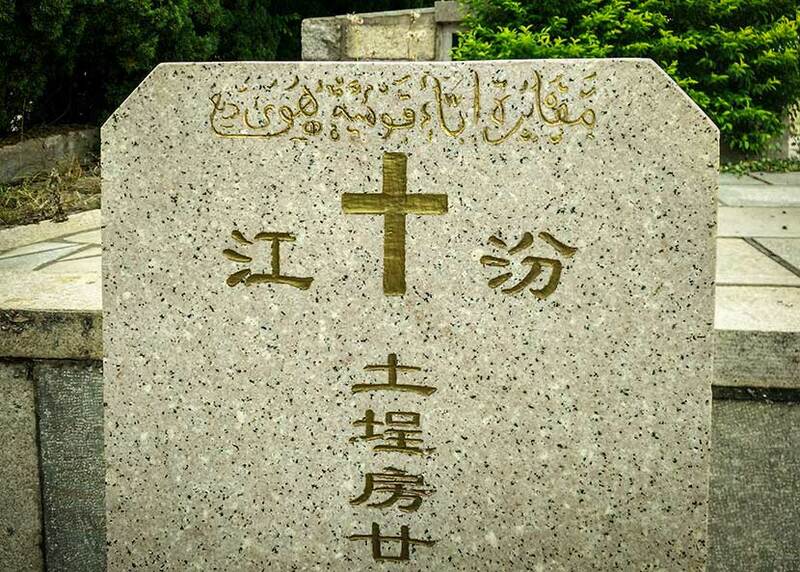 According to the locals, although many Hui descendants of the Ding clan in Quanzhou converted to Christianity during their lifetimes, they decided to be buried in a sacred Muslim burial ground. Influenced by the local culture and aesthetics, the bases of many headstones on the mountain feature colorful Chinese illustrations combined with flowing Arabic calligraphy. Most of these Hui Muslim ancestors fled to Lingshan during the fall of the Yuan Dynasty and the advent of the Ming. At the time, as in nearby Fuzhou, violent conflicts frequently broke out between Han locals and powerful members of the semu: a caste of central Asian soldiers — many of whom were Muslims — tasked with defending the Yuan imperial state. Muslims who remained behind gradually assimilated into Han society, and their lifestyles, customs, and funeral rites took on many distinctly Han traits. The mosque in Chendai appears small and shabby. When I went inside, not a soul was there — not even the imam. After leaving Lingshan, I visited two Hui “ethnic towns” near Quanzhou: Chendai and Baiqi. The former is now more famous for its shoemaking industry than the mosque built on land leased from the ancestral temple of the Ding clan next door. In comparison to the rather majestic ancestral temple, the mosque appears small and shabby. In the courtyard, there is a little tower with a prayer hall on its second floor. When I went inside, not a soul was there — not even the imam. In the 1990s, the Hui descendants of the Ding clan in Chendai would parade in the streets every Tomb-Sweeping Festival with a copy of the Quran from their ancestral temple. They would even invite the imam from Quanzhou Mosque to participate in their celebrations, but when the holy man told them that it was against Muslim customs for him to join the festivities, they stopped inviting him. The other town, Baiqi, doesn’t have a mosque at all. I was able to find some burial grounds dating from the Qing Dynasty, but none of them seemed distinctly Islamic. Today, Baiqi’s status as an ethnic village has given rise to many kitsch faux-Arabian buildings. Local government offices and schools are newly built, poorly rendered adaptations of Islamic architecture, with distinctive domed ceilings. In Quanzhou, one of the first places where Islam was introduced to China, locals are largely ignorant of the centuries of religious history. Yet most do not seem perturbed by the city’s fading faiths. Today, while Quanzhou trades tea, rice, and bananas to the world, its port is now devoid of the rich Muslim merchants who contributed to this thriving, cosmopolitan city. Translator: Lewis Wright; editors: Wu Haiyun and Matthew Walsh.